Thorlabs' state-of-the-art, in-house, optical coating department provides us with coating capabilities ranging from metal coatings and antireflective coatings to cutting edge Ion Beam Sputtered (IBS) and Plasma Assisted coatings. This full-scale facility not only allows us to produce large numbers of our catalog optics in house but also expands our ability to manufacture custom-coated optics to suit a variety of customer needs. The spectral performance and other key characteristics of optical thin films are determined by the structure and number of layers in the coating, the refractive indices of the materials used, and the optical properties of the substrate. The structure of most coatings resembles a series of discrete alternating layers of high index and low index materials. Different arrangements of stack structure result in different types of coatings (e.g., Bandpass vs. Edgepass vs. BBAR). Fine tuning of layer thicknesses and refractive indices is done to optimize performance characteristics in the wavelength range of interest. Thorlabs has a selection of thin film modeling tools to design, characterize, and optimize many aspects of an individual coating's performance. The first and one of the most critical steps of our process is cleaning uncoated substrates with an automated ultrasonic clean line. 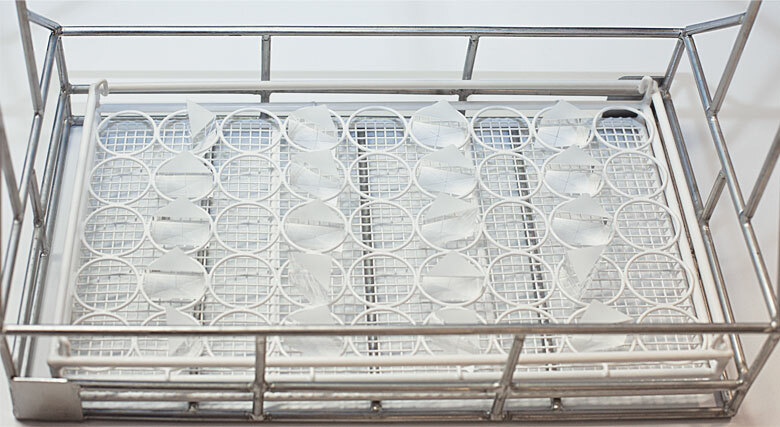 Using a series of ultrasonic solvent and detergent baths, each step of the cleaning process removes different types of contamination from the surfaces of the substrate. This ensures surface contamination does not interfere with adhesion of coatings to the substrate. Thorlabs' coating facility currently operates four fully automated Electron Beam (E-Beam) deposition systems. These systems use an electron beam source to evaporate a selection of materials such as transition metal oxides (e.g., TiO2, Ta2O5, HfO2, Nb2O5, ZrO2), metal halides (MgF2, YF3), or SiO2. This type of process must be done at elevated temperatures (200 - 250 °C) to achieve good adhesion to the substrate and acceptable material properties in the final coating. Ion-Beam Assisted Deposition (IAD) uses the same E-beam method to evaporate coating materials but with the addition of an ion source to promote nucleation and growth of materials at lower temperatures (20 - 100 °C). 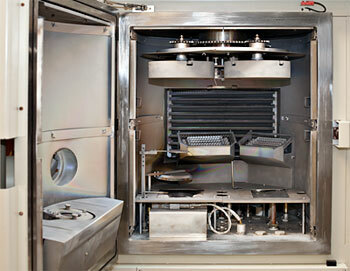 The ion source allows temperature-sensitive substrates to be coated. This process also results in a denser coating that is less sensitive to spectral shifting in both humid and dry environmental conditions. 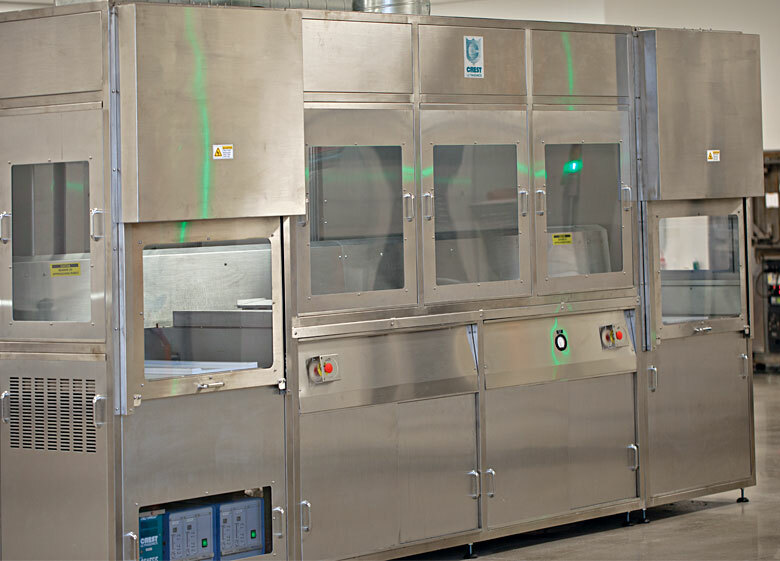 Our Ion Beam Sputtering (IBS) deposition chamber is the most recent addition to our line-up of coating tools. 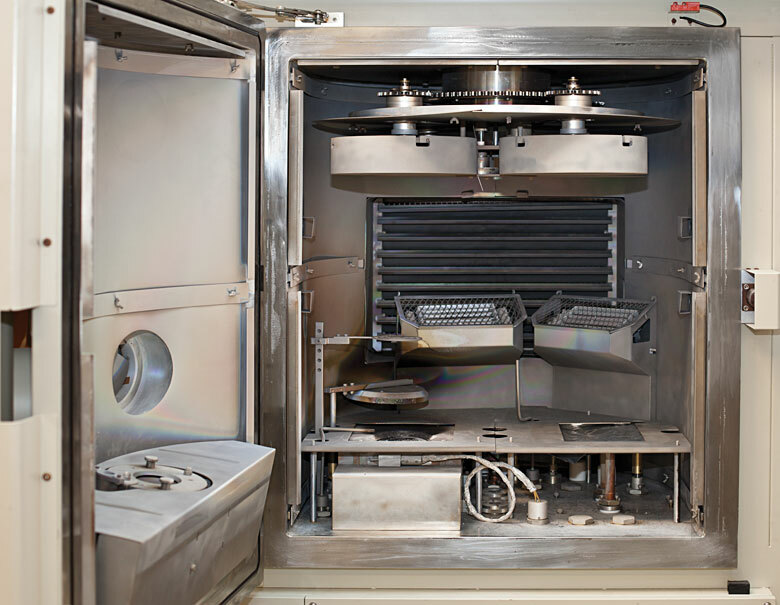 This process uses a high energy, radio frequency, plasma source to sputter coating materials and deposit them on substrates while another RF ion source (Assist source) provides IAD function during deposition. The sputtering mechanism can be characterized as momentum transfer between ionized gas molecules from the ion source and the atoms of the target material. This is analogous to a cue ball breaking a rack of billiard balls, only on a molecular scale and with several more balls in play. Thorlabs uses a selection of research-grade spectroscopy instruments to characterize coating performance from the UV to the Far Infrared. Varian Cary 5000 and PE Lambda 950 spectrophotometers are used to characterize the spectral performance of our coatings in the UV-VIS-NIR ranges and an Olis PE 983 IR spectrophotometer is used for infrared coatings (2 - 55.5 µm). In addition to the spectroscopy tools, we also use a variety of laser and laser diode sources, power meters, detectors, and polarimeters to test the performance of our optics. We build custom setups to test both catalog and OEM parts to ensure every optic we offer performs well within the specified range. All of our metrology instruments are calibrated regularly per ISO 9001:2015 standard. Laser Line and Bandpass filters transmit light in a narrow, well-defined spectral region while rejecting other unwanted radiation. 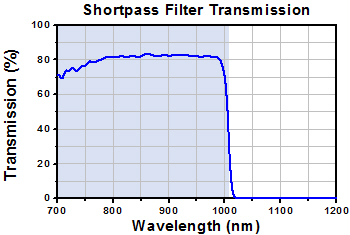 This type of filter displays very high transmission in the bandpass region and blocks a limited spectral range of light on either side of the bandpass region. To compensate for this deficiency, an additional blocking component is added, which is either an all-dielectric or a metal-dielectric depending on the requirements of the filter. Although this additional blocking component eliminates any unwanted out-of-band radiation, it also reduces the filter's overall transmission throughput. 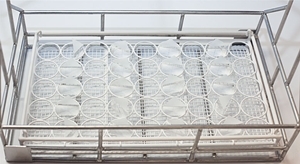 These coatings are formed by vacuum deposition coating techniques and consist of two reflecting stacks, separated by an even-order spacer layer. 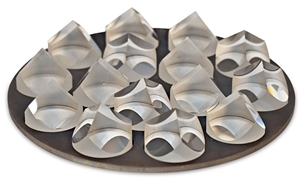 These reflecting stacks are constructed from alternating layers of high and low refractive index materials, which can have a reflectance in excess of 99.99%. By varying the thickness of the spacer layer and/or the number of reflecting layers, the central wavelength and bandwidth of the filter can be altered. Edgepass filters are very useful for isolating specific spectral regions. 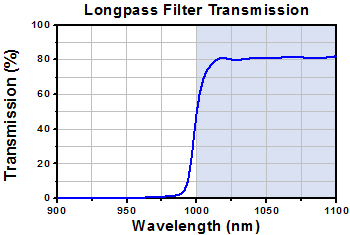 Longpass filters transmit wavelengths longer than the cutoff wavelenght and block wavelengths shorter than the cutoff wavelength. 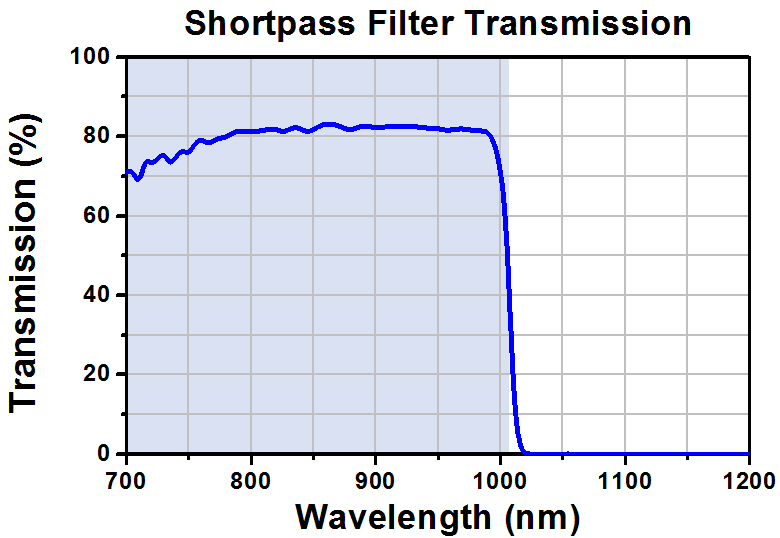 Shortpass filters block wavelengths longer than the cutoff wavelength and transmit those shorter than the cutoff wavelength. 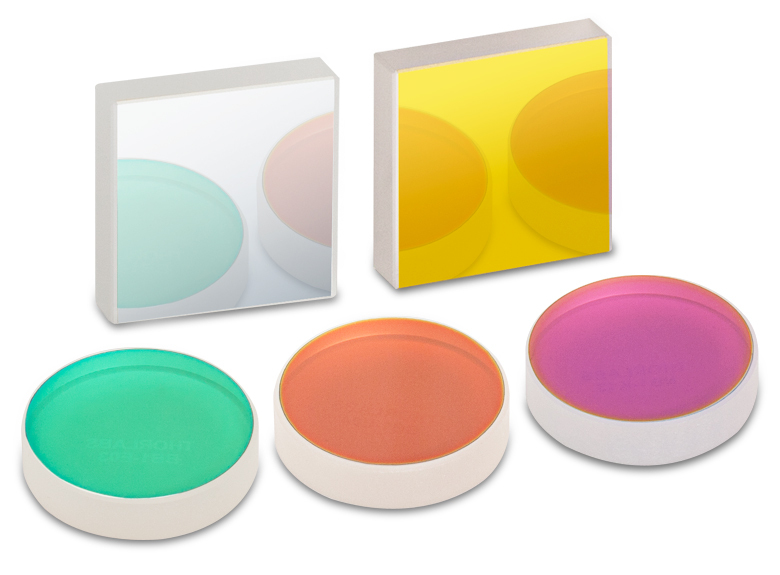 All Thorlabs edgepass filters are constructed of durable dielectric coatings and will withstand the normal cleaning and handling associated with any high-quality optical component. 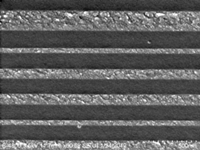 Their film construction is essentially a modified quarter-wave stack, using interference effects rather than absorption to isolate their spectral bands. Dichroic Beamsplitters are used as beam directors at 45° and are either longpass or shortpass. 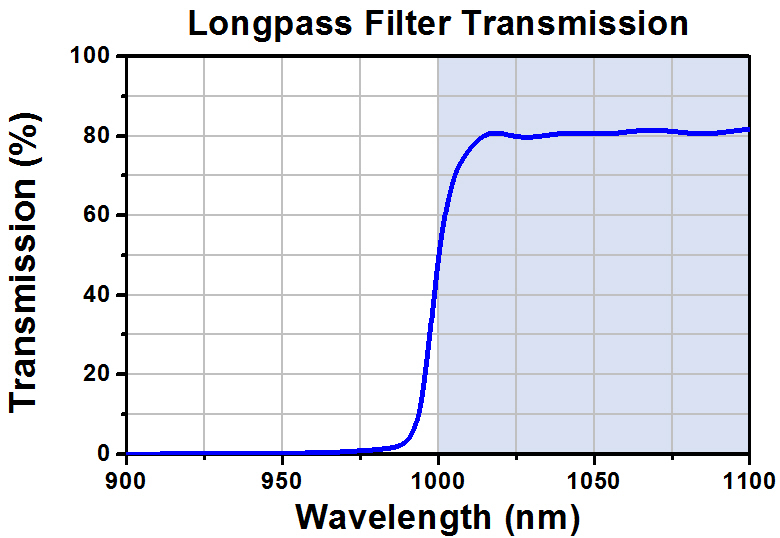 The longpass variety reflects >90% of the incident light below the design wavelength and transmits >90% of the incident light above the design wavelength. The shortpass variety transmits below the design wavelength, and reflects above the design wavelength. Dichroic beamsplitters are used in many applications, the most common one being fluorescence microscopy. The dielectric coating on dichroic beamsplitters is the source of their functionality. The alternating layers in the coating are designed to cause constructive interference for those wavelengths to be transmitted and destructive interference for those wavelengths to be reflected. The thickness of the coating and the refractive index of the materials in the layers determine the design wavelength for a given beamsplitter. 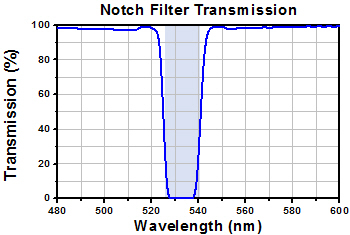 Notch filters, also commonly referred to as band-stop or band-rejection filters, are designed to transmit most wavelengths but attenuate light within a specific wavelength range (the stop band) to a very low level. They are functionally the inverse of bandpass filters and are made in the same way. Neutral Density (ND) filters attenuate all wavelengths within a range by a certain factor to prevent damage to detecting equipment. Fixed ND filters attenuate the spectra by a fixed amount. Variable ND filters have stepped films at discrete locations to allow for various attenuation depending on the application. Continuous ND filters have a film gradient across the entire filter, which allows for a continuous range of attenuation. Thorlabs offers a selection of both linear and circular variable and continuous ND filters. Antireflective (AR) coatings are hard refractory-oxide coatings that minimize surface reflections within specified wavelength ranges when applied to the surface of optical components. Without AR coating, 4% of the light is lost at each optical surface due to reflections. For example, if three uncoated lenses are being used in series, this 4% loss occurs at each of the six optical surfaces. This results in a total loss of 21.7%. If three AR-coated lenses with a "B" coating (Ravg <0.5% per surface) are used instead, the total loss of incident light due to surface reflections is <3%. The use of AR-coated optics improves transmission from 78.3% to greater than 97% in this case. Please note that the 4% loss at the interfaces of uncoated optics is an approximate value that varies greatly with material and angle of incidence (AOI). Please note that the color of the lens does not correlate to the lens’ specifications. The color of each AR coating may vary from batch to batch and is not an indicator of performance. 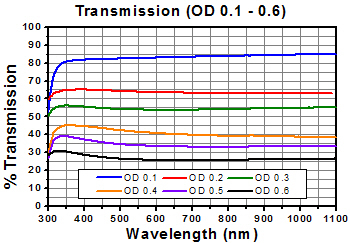 The AR Coating Range graph below shows the specified wavelength range of Thorlabs' in-house AR coatings. Click on the bars in the graph below to view the performance plot for each coating. Broadband antireflective (BBAR) coatings consist of multiple layers, alternating between a high index material and a low index material. The layers are deposited on the substrate via electron-beam deposition. The thickness of the layers is optimized, using modeling software, to produce destructive interference between reflected waves and constructive interference between transmitted waves. This results in an optic that has enhanced performance within a specified wavelength band as well as minimal internal reflections (ghosting). Thorlabs' BBAR coatings provide good performance for angles of incidence between 0° and 30° and a numerical aperture (NA) of 0.5. Thorlabs currently offers BBAR coatings designed to maximize performance within 8 different wavelength ranges. V-coatings are multilayer, dielectric, thin-film, AR coatings that are designed to minimize reflectance over a short wavelength range. Surface reflectance rises rapidly on either side of this minimum, which gives the reflectance curve a "V" shape. 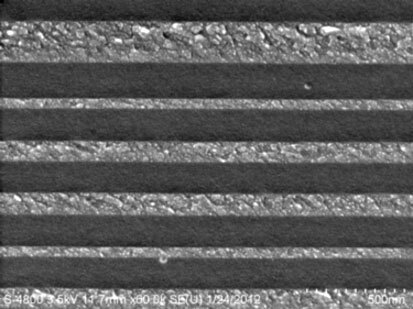 Compared to the broadband AR coatings, V-coatings achieve lower reflectance over a narrower bandwidth when used within their design AOI range. See the graph to the right for an example of the reflectance of a 633 nm V-coat designed for 0° AOI at various angles. We offer a variety of different V-coatings; see the table below for more information. 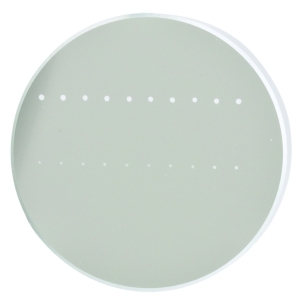 The tables below give the specifications for Thorlabs' in-house antireflection coatings, which are deposited on the surfaces of many optics in our catalog. However, we also offer optics that are coated by external vendors. As such, the specifications for some of our antireflection coated optics may be slightly different than the specifications given on this page. The AR coating specifications for any individual item are always included in that item's web presentation. To calculate Ravg, the reflectance is measured over the specified wavelength range and then averaged. The shaded region in the plots represents the specified wavelength range for optimum performance. Optical coatings vary from run to run. The specifications provided throughout our website are true for all coating runs. However, these plots give you some idea of the variation that does occur. The UV coating wavelength range specification was recently updated from 290 - 370 nm to 245 - 400 nm. 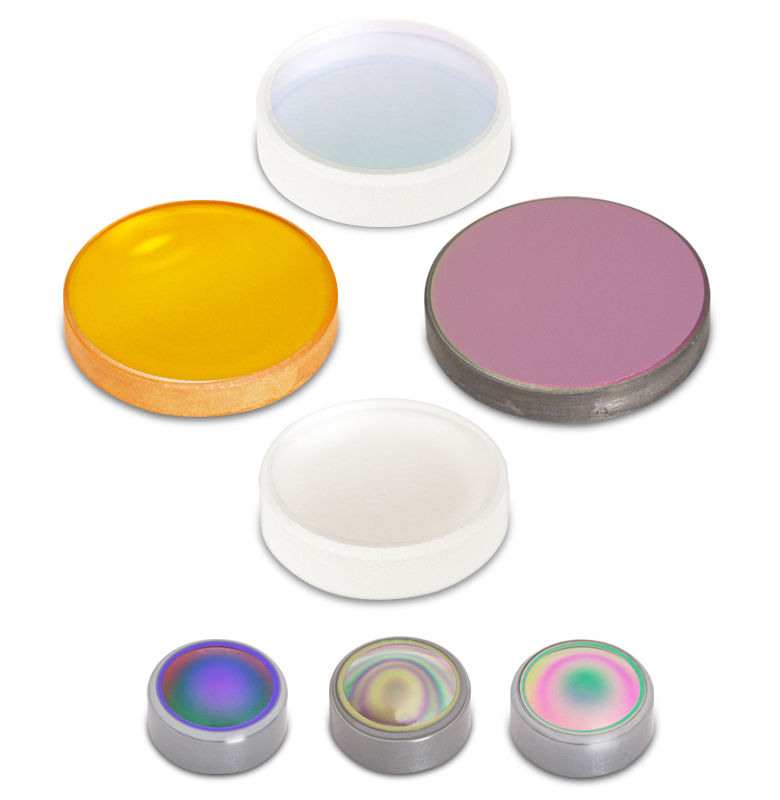 All optics in stock currently have a UV coating with a wavelength range of 245 - 400 nm. However, we are in the process of updating our documentation, and so some individual optics may still be presented with the old wavelength range on our website. The C coating wavelength range specification was recently updated from 1050 - 1620 nm to 1050 - 1700 nm. 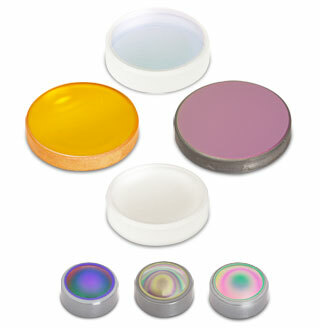 All optics in stock currently have a C coating with a wavelength range of 1050 - 1700 nm. However, we are in the process of updating our documentation, and so some individual optics may still be presented with the old wavelength range on our website. Manufacturing processes of E-coated optics have recently changed. Physical appearance (e.g., color) of these optics may vary based on factors including materials and processes. The specified performance will be achieved regardless of color variations. The E and E1 coatings offer similar performance, but the -E1 coating guarantees an absolute reflectance of <3.0% over the specified wavelength range. The G and E3 coatings offer similar performance, but the -E3 coating guarantees an absolute reflectance of <2.0% over the specified wavelength range. The reflectance is measured at the design wavelength. The tables below give specifications for our broadband and narrowband high-reflectance (HR) coatings. Thorlabs offers dielectric and metallic broadband coatings, as well as dielectric narrowband coatings for laser line applications. We also offer specialty ultrafast mirrors for femtosecond pulsed lasers. Dielectric HR coatings, available in broadband or narrowband designs, are hard, refractory, oxide coatings that maximize surface reflections within a specific wavelength range and angle of incidence. The coating consists of alternating layers of high and low index materials. The layer's thickness is optimized, using computer models, to produce constructive interference for reflected waves and destructive interference for all other wavelengths. The reflectance of the surface is improved greatly by the addition of an HR coating; however, its performance is dependent on the angle of incidence (AOI). At high AOIs, the reflection band shifts to shorter wavelengths and performs differently for S and P polarizations. Thorlabs currently offers nine different broadband HR coatings optimized for various performance parameters. The graph below shows the specified wavelength range of Thorlabs' in-house broadband HR coatings. Click on the bars in the graph below to view the performance plot for each coating. Click here for a raw data file that compares all of our broadband HR Coatings. The E01, E02, E03, and E04 dielectric HR coatings offer high reflectance over broad wavelength ranges. Our UV-Enhanced Aluminum coating has an overcoat of MgF2 to increase the average reflectance in the UV portion of the spectrum. The Protected Aluminum coating is an inexpensive solution and has an overcoat of SiO2 to make the aluminum coating suitable for laboratory and industrial use. Of the metallic coatings, the Protected Silver coating has the highest reflectance in the visible spectrum to prevent oxidization, the silver surface is protected with an SiO2 overcoat. The Ultrafast-Enhanced Silver coating is manufactured such that it retains a low group delay dispersion. Three gold coating options are offered: protected, MIR enhanced, and unprotected. The Protected Gold coating retains a high reflectance down to 800 nm, while the MIR enhanced gold coating is optimized to reduce loses in the MIR that are commonly found in gold mirrors. Each coating in protected by an overcoat that also makes the mirror easy to clean. The Unprotected Gold coating offers higher reflectance than the protected gold coating, but is slightly more delicate. Click each link to view our standard fused silica mirror offerings with that coating. Click here to view our complete line of HR-coated optics. The reflectance is measured over the specified wavelength range and then averaged. All diameters are the 1/e2 values. The power density of your beam should be calculated in terms of W/cm. For an explanation of why the linear power density provides the best metric for long pulse and CW sources, please see the "Continuous Wave and Long-Pulse Lasers" section in the Damage Thresholds tab. Thorlabs currently offers twelve different laser line HR coatings optimized for various performance parameters. These dielectric HR coatings offer very high reflectance over specific laser line wavelength ranges. Click to view our round mirror offerings. Unless otherwise specified, the reflectance is measured over the specified wavelength range and then averaged. For our K07 coating, we specify the minimum reflectance at 352 nm. We also offer unmounted and cage-cube-mounted right angle prism mirrors. Hello Garth, thank you for contacting Thorlabs. Custom coatings on our optics can be requested by emailing techuspport@thorlabs.com. We will reach out to you with information about this and the extended transmission plots for the A and C coatings. Hello Oscar, thank you for your feedback. In terms of vacuum compatibility, we do not test our parts beyond 10^-8 Torr, where our vacuum viewports are certified. While we cannot comment on behavior at 10^-9 Torr, we do not expect any issues at that lower pressure for our dielectric optical coatings. As for 150°C temperatures, we also would not expect any issues with our dielectric coatings, as long as the temperature is kept at a consistent temperature rather than cycled high and low. 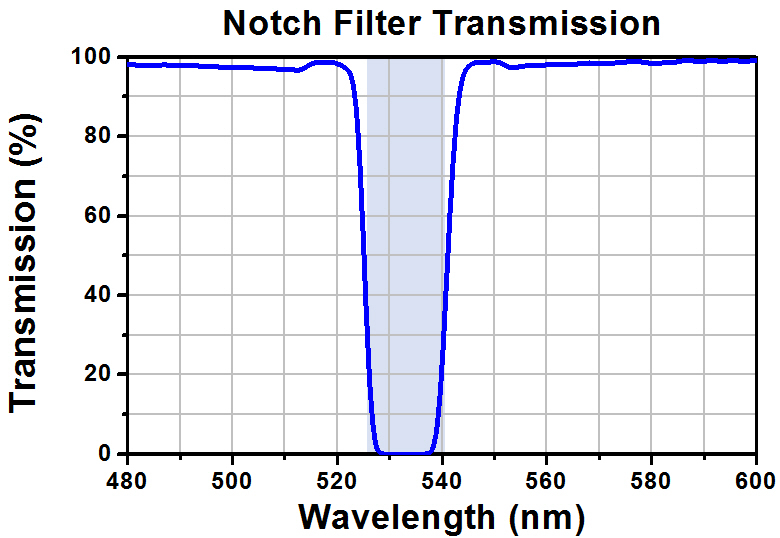 It sounds like a notch filter could be most useful for you to "trap" 1064 nm wavelengths after passing through the AR coating. I will reach out to you directly to discuss your application further. Thank you for contacting Thorlabs. Unfortunately the materials used in our coating designs are proprietary information. I will reach out to you directly to discuss your application. Hi, I am modeling the SOLIS3C source in Zemax and I wanted to know how to model the scattering properties of the frontal face of said source. Is there a particular black coating to use for this purposes? thanks. This is a response from Nicola at Thorlabs. Thank you for your inquiry. For analyzing the scattering properties for our SOLIS LEDs, we recommend to use a tool called LensMechanix that comes with different scattering profiles. However, Zemax OpticStudio also provides different materials as well as a coating file that could be used and edited. SOLIS LEDs contain different materials at the front face of the housing. The choice of the best suited coating therefore depends on the exact part of the housing you would like to model. We will contact you directly to provide further assistance. Dear Thorlabs! Can you provide the band-pass filter interference coatings on the surfaces with high positive curvature, for example, sphere or hemisphere? The transmission features of this coating should be even over all sphere/hemisphere.surface. thank you in advance! Vitaly Tsukanov. Hello Vitaly, thank you for contacting Thorlabs. One thing to note is that these coatings are designed for specific AOIs since the performance is dependent on that. With a spherical design, the AOIs will be all over the place. We will reach out to you directly via email to discuss this further. I am designing a broad-band optical system, with wavelengths between 300 and 1000nm. Do you have specifications of the B coating in the wavelength range between 300 and 650 nm, and for the A coating in the wavelenght range of 650-1000nm? Hello, thank you for contacting Thorlabs. While we don't specify the out-of-band performance of our AR coatings, I'd expect over such a large range that there would be significant reflection peaks. These would change from one coating run to another, but I would not be surprised to see peaks of 10-40% at some out-of-band wavelengths. Uncoated optics may be better for your application. I will reach out to you with more details. Thank you for contacting Thorlabs. Unfortunately our coating designs are proprietary information. Dielectric reflective coatings consist of multiple layers of varying high and low refractive indexes. The coatings are created by stacking different dielectric materials on top of one another and the thickness of these layers and number of layers create the reflectivity at a specified design wavelength range. I appreciate your delicate products. Can you provide dielectric coated "glass slide" and "cover slip"? Thank you. Hello, thank you for contacting Thorlabs. We can offer many different coatings for different substrates. I will reach out to you about the needs of your application. If I cement an optical window with a C coating to another element using Norland NOA 60, what will be the reflection at the coating/cement interface at 1550nm? Hello, thank you for contacting Thorlabs. All of our anti-reflection coatings are designed for a glass-air interface, and using an adhesive like NOA60 on the surface would disrupt that design. It would not continue to function as an anti-reflective coating. I will reach out to you directly to discuss this. Kind Thorlabs, is it possible to receive from you coating files for LightTools? Or, if it is not possible to provide coating data for LightTools, could you please provide table data for THORA and THORB coatings, and I will make coating files by myself. Hello, thank you for contacting Thorlabs. Unfortunately, the prescriptions of our AR coatings are proprietary, and we are unable to provide the tabular data or a model for them. You can however use the typical reflectance curves we give as a guide. I will reach out to you directly. Dear Thorlabs, we are looking optical windows operated at 900+/-20nm wavelength with 60+/-5 degrees AOI. Would you please give us transmission curves for s- and -p polarization components for your BB AR B-coating on N-SF11 glass? This coating is used for your Anamorphic Prisms. Thank you! Dear Thorlabs, what is the reflectance of the lens with C coating for wavelength 850 nm? Thank you! Response from Bweh at Thorlabs USA: You could have as much as 18% loss in reflection from each surface from the antireflection coating. Please contact me at techsupport@thorlabs.com for a typical reflectivity data of the AR coating outside its design range. Dear Thorlabs team, in the HR coating tab you state the materials of the overcoat of protected silver (SiO2) and UV-enhanced aluminum (MgF2), but not of the protected gold. Due to material compatibility considerations, it would be nice if you could tell me i) if the overcoat of protected gold mirrors is the same / comparable to the one of protected silver in material and deposition method (EBD? ), and ii) if there are any fluorine-containing chemical compounds like MgF2 present in protected silver or gold mirrors. Thank you! Response from Mike at Thorlabs: Thank you for your feedback. We are currently unable to specify the exact composition of the overcoat on our gold coated surface. The raw data xlsx file supplies reflectivities for the various HR coatings. What polarization and angle was used for this data or is it an average? Specifically I am worried about the reflectivity at 8 degree and 45 degree for wavelengths at the edge of the range for E02 at e.g. 397 and 866 nm. In our optical setup we observed laser induced contamination on half-wave plates (WPMQ05M-532). The power density on the optic was about 30 W/cm². All other components (N-BK7 lenses, Glan-Taylor polarizer, Mirrors, ...) do not show these contaminations. We assume that this may be related to different "chemical reactions" on the different coating surfaces of the optics. Could you tell us the production methods (EBD, IAD, ...) of the WPMQ05M-532, a BBAR - A and a HR E02 coating? What is the material is forming the most outer layer (being the one in contact with the ambient air.)? Thanks in advance! Response from Jeremy at Thorlabs: We have not seen this issue before and we use similar coatings on other optic parts. It would be good to see if cleaning the surfaces of the wave-plates would remove this issue you are having. I will contact you directly to get more detail on this. Is data available on the AR-B coating for wavelengths outside the nominal range? Response from Tim at Thorlabs: Thanks for your inquiry. There will be variations in coating runs but we can supply representative out of band data. I've emailed you to discuss your wavelengths. Response from Jeremy at Thorlabs: We now supply both the ZAR file and the ZMX file. The ZAR file provides you with the ZMX file as well as any supporting files. This includes the coating file. You will not run into that issue with the use of the ZAR file. Response from Jeremy at Thorlabs: Our dichroic coating are designed to be used in air/vacuum. Therefore, putting the coating in direct contact would produce a significant difference in performance. In general, do you expect a significant difference in dichroic coating performance if the coated side of the substrate is placed in contact with a material with a refractive index ~2? Response from Buki at Thorlabs: Thank you so much for your feedback. We are expanding our manufacturing capabilities and hope to be able to communicate a coating schedule in the future. Till then, you can request custom coated optics by emailing TechSupport@thorlabs.com. There is really great, can we see a coating schedule thta would show available slots?